In the Preface to the 2nd edition of The Lord of the Rings Tolkien declared that “By 1918 all but one of my close friends were dead”. Tolkien’s closest friends were those he had made in King Edward’s School, Birmingham, and the narrative of John Garth’s Tolkien and the Great War, which I follow closely here, rightly begins there. His closest friends were Christopher Wiseman, Rob Gilson and Geoffrey Bache Smith: they were the core of the Tea Club, which later became the Barrovian Club or Society, or the Tea Club and Barrovian Society, TCBS for short: they used to meet in Barrow’s Stores. They still met up after they had all left school. When JRRT got to Oxford in 1911 he enrolled in the King Edward’s Horse, which was the Officers’ Training Corps for those with colonial backgrounds in both Oxford and Cambridge. He spent two weeks in July and August 1912 at its summer camp in Folkestone. But he gave this activity up in 1913, and he did not rush to enlist when war came in 1914, as his brother Hilary and many of those he knew in Oxford did. He did enrol in the OTC, however. On 12 December 1914, he held the Council of London with his TCBS friends, Gilson, Smith and Wiseman. They were very idealistic young men, who had been determined to change the world for the better; later on JRRT came to see this meeting as a turning point in his own ideas about the future—a future that was, of course, thanks to the War, so uncertain. Two later meetings of the TCBS had to be called off, because of military commitments. Smith changed regiments at Easter 1915, to the 19th Lancashire Fusiliers, in the hope Tolkien would join him. 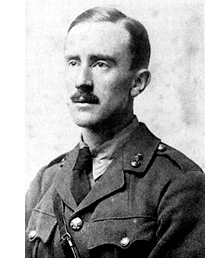 On 28 June 1915 Tolkien successfully applied in Oxford for an officer’s commission “for the duration of the war”. A few days later, on 2 July, he heard he had got a First in his Finals, and a week after that, on 9 July, JRRT heard that he should report to his regiment, as a second lieutenant. But it was not the 19th Lancashire Fusiliers that he had asked for, but the 13th. He tried to transfer to the 19th to join Smith, but was unable to do so. On 11 July 1915 Wiseman wrote to JRRT to say he was going to sea in the Navy. First Tolkien had to do an officer’s course in Bedford. He decided to specialise in signals (just as A.A. Milne did). On 22 March 1916, JRRT married Edith, in Warwick; on 13 May Tolkien was issued with a certificate permitting him to instruct army signallers. The following month he set off for the Front, landing in Calais on 6 June 1916, and joining the 11th Lancashire Fusiliers at Rubempré, north of Amiens, on 28 June. On 1 July 1916, on the first day of the Battle of the Somme, his friend Gilson led his men over the top. He and his sergeant-major were killed in the same shell burst, and more than five hundred of the Cambridgeshires were wiped out. Smith survived a similar assault, and was able to meet up with JRRT on 6 July; JRRT was busy trying to restore a badly damaged signalling infrastructure. His 11th regiment lost 267 men in a fortnight in July, and on 21 July JRRT was promoted to battalion signal officer, and probably to acting full lieutenant. Smith wrote to JRRT with news of Rob Gilson’s death. “I am safe, but what does that matter? Do please stick to me, you and Christopher. I am very tired and most frightfully depressed at this worst of news. Now one realised in despair what the TCBS really was. O my dear John Ronald what ever are we going to do?” (quoted Garth, 168). Tolkien replied: “What I meant, and thought that Chris meant, and am almost sure you meant, was that the TCBS had been granted some spark of fire—certainly as a body if not singly—that was destined to kindle a new light, or, what is the same thing, rekindle an old light in the world; that the TCBS was destined to testify for God and Truth in a more direct way even than by laying down its several lives in this war” (quoted Garth, 180). Tolkien’s battalion launched a successful assault on 19 October 1916, and were then switched from the Fifth Army (on the Somme) to the Second Army (at the Ypres Salient). On 27 October, Tolkien reported to the medical officer with trench fever, which was generally passed on by lice. He was transferred to hospital on 28 October, and on 8 November 1916 left France. On 9 November he was in bed at Birmingham University Hospital, and was soon able to reunite with Edith. Rob Gilson’s sister Molly was there also, dressing wounds for the army surgeon, Major Leonard Gamgee (he was related to Sampson Gamgee, the Birmingham surgeon who had pioneered techniques for aseptic surgery in the previous century, and invented Gamgee Tissue, a surgical dressing, and in addition presumably suggesting to JRRT years later the name of Frodo Baggins’ “batman” Sam). On 29 November, JRRT’s TCBS friend Smith was wounded by shrapnel, and he died 3 December 1916. Wiseman broke the news to JRRT: “I humbly pray Almighty God I may be accounted worthy of him” (quoted Garth, 212). A day earlier, on 2 December 1916, Tolkien was called before a military medical board, and was predicted to be fit in six weeks. He faced a second medical board in Birmingham University Hospital on 23 January 1917. His fever had returned twice, and he was sent to convalescent hospital in Harrogate. After a month he was found fit for light work; he spent some time on leave, and joined up with Wiseman. On 19 April 1917, Tolkien joined the Humber garrison, on Holderness peninsula; this was clearly the “light work” for which he was fitted, and a large proportion of his fellow officers there were equally unfit. On 1 June 1917, Royal Army Medical Corps officers found him fit for general service, but he was to stay in Humber Garrison nevertheless (rather than being sent to Messines Ridge, where the 11th Lancashire Fusiliers were being slaughtered). His fever returned, and he spent nine weeks in Brooklands Officer’s Hospital, outside Hull. He was promoted to full lieutenant. In 1918 he was then posted back to the 13th Lancashire Fusiliers, where he had started, and sent to camp on Cannock Chase. On 26 July he was ordered to join the 11th battalion in France; but by the time he received the order he was already back in hospital, with gastritis, and the order was rescinded. The bureaucrat who had sent him the order had also failed to note that the 11th Lancashire Fusiliers had been virtually wiped out on 27 May, in the German offensive, and was officially disbanded. By October he was already back in Brooklands Hospital. On 11 October 1918 he was sent to the Savoy Convalescent Hospital in Blackpool. After Armistice Day he asked to be stationed in Oxford, and he started work for the New English Dictionary (later renamed the Oxford English Dictionary). He was not officially demobbed until 15 July 1919. The only friend from the TCBS who was still alive was Christopher Wiseman. He became a schoolteacher. They had a falling out, but did stay in touch, and Tolkien named his third son after him. They met up again after they had both retired; and a letter Tolkien wrote to him in 1973 he signed “your most devoted friend, JRRT TCBS” (quoted Garth, 284). All my information comes from the excellent book by John Garth: Tolkien and the Great War: The Threshold of Middle Earth (London: HarperCollins, 2003).